We’d love your help. 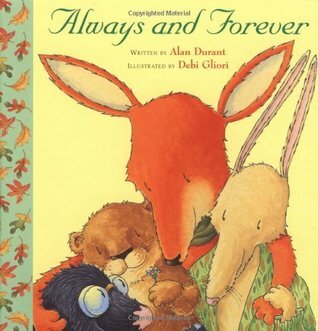 Let us know what’s wrong with this preview of Always and Forever by Alan Durant. When Fox dies, Mole, Hare, and Otter are devastated. They feel they will never get over their great sadness. How can life go on without him? Then one day Squirrel comes to visit. She reminds Fox's family of all the funny things he used to do. And as the friends share dinner and tell stories, they realize at last that in their hearts and memories, Fox is still with them, an When Fox dies, Mole, Hare, and Otter are devastated. They feel they will never get over their great sadness. How can life go on without him? Then one day Squirrel comes to visit. She reminds Fox's family of all the funny things he used to do. And as the friends share dinner and tell stories, they realize at last that in their hearts and memories, Fox is still with them, and he will be--always and forever. 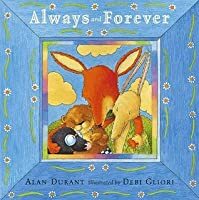 With thoughtful, delicate illustrations by acclaimed artist Debi Gliori, this gentle story is just right for anyone who has experienced the loss of a loved one. To ask other readers questions about Always and Forever, please sign up. Yet another AMAZING and WONDERFUL grief book for children. Otter, Mole, Fox and Hare are all good friends who live in the woods together. Everyone works hard and has their strengths and helps each other. They were a happy family, and they loved each other dearly. But one day, Fox fell ill. As the leaves started to drop from the trees, Fox grew thin, pale, and sad. One morning, he went out alone into the woods and didn't come back. Wow. We see Fox's prone body in the autumn woods. His family found Yet another AMAZING and WONDERFUL grief book for children. His family found him, still and cold, covered in leaves, beneath an oak tree. With sadness, they carried him home. They bury fox under the willow tree – his favorite place. They weep over his grave. Everyone is very sad. They tell each other the good things about Fox. They share stories about how wise, clever, and kind he was. Remembering the things they loved about Fox made his family miss him all the more. Even talking about him made their hearts ache. All winter they are very sad and very quiet. Then spring comes. And so does Squirrel. “We've been too sad to go out,” Mole tells Squirrel. “We miss Fox too much,” said Hare. “How can it, without Fox?” said Otter, and he started to cry. They all start to cry, and Squirrel can't comfort them, no matter how hard she tries. But when Squirrel stays for dinner, she subtly tells a funny story about Fox's cooking and how terrible it was. This makes everyone smile as they remember him. Then Hare chimes in with a funny story about how terrible a carpenter Fox was, and how he once made a chair that fell apart the first time someone sat in it! Then Mole tells a funny story about Fox making a gardening mistake. Everyone laughs. They laugh for the first time in ages. “You know,” Hare said after a while, “I'm going to make a special garden for Fox under the willow tree.” She smiled. Mole plans to build a bench under the tree for people to sit on. And Otter vows to bake Fox's potato pie once a month. So they do all these things. Eating the pie every month, and sitting in the garden dedicated to Fox, everyone recalls happy times. As they laughed, they felt they could hear Fox laughing too, as if he were still there with them. And in their hearts and their memories and their laughter, Fox WAS still there, part of their family, beloved friend and companion – always and forever. Tl;dr – Well, that was super amazing. I love how the close friends refer to each other as “family” even though they are from different species. I love how at first, talking about Fox makes their grieving worse. They grieve for months. I love how Squirrel comes in and makes them all laugh by starting them up talking about funny things Fox did in life. Then all the animals find their own way to honor foxes memory and keep it alive in the present. And it works! Fox will live on in their hearts and their thoughts. I also love how Fox gets ill, his appearance changes and he's sad – and then he goes off into the woods to die. I love how the book actually shows his body and has the animals find him, carry him home and bury him. Children often have a need and a desire to know specifics – where did Grandpa go? Where is his body? What will happen to him? This book addresses those concerns in a gentle and sweet way. I was recommended this book after our school experienced the loss of a student. This was an appropriate book for my kindergarten students and approached the topic of grief appropriately. This is a heart warming story about a group of friends made up of a Fox, Mole, Hare and Otter. The group are left devastated when they discover that their dear friend Fox has passed away. The animals feel as though there lives cannot go on and they don't know how to cope without Fox. One day, their friend Squirrel comes to visit and he reminds the animals of all the times that they had spent with Fox and the memories they had shared, the animals began to see that life could go on,and in order fo This is a heart warming story about a group of friends made up of a Fox, Mole, Hare and Otter. The group are left devastated when they discover that their dear friend Fox has passed away. The animals feel as though there lives cannot go on and they don't know how to cope without Fox. One day, their friend Squirrel comes to visit and he reminds the animals of all the times that they had spent with Fox and the memories they had shared, the animals began to see that life could go on,and in order for them to feel as though they could move on, they needed to go through the process of grief. The book itself has beautiful illustrations and a lovely narrative. This would be a useful resource to have in a classroom, suitable for both KS1 and KS2. Unfortunately, death is something that as a teacher we may encounter and have to talk to children about, and this book, 'Always and forever', would lighten the topic and be an interesting book to base a circle time session or in a PSHE class, to help children express their feelings during a time of grieve, whether it is a family member, friend or a pet. 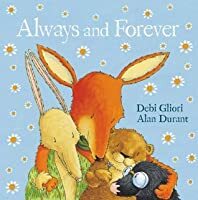 'Always and Forever', can help young children understand that when they lose someone, they are not alone in these situations. I read this book as part of an RE lesson and thought it was excellent and really thought provoking. I found that it would be really useful for a PSHE lesson or circle time when dealing with death. The theme of death is a difficult one to deal with when working with children, but it occasionally (unfortunately..) might be necessary, so I think that this book should be on hand if it is required. The story is about a friendship group, a fox, an otter and a hare. The fox passes away and the novel fol I read this book as part of an RE lesson and thought it was excellent and really thought provoking. The story is about a friendship group, a fox, an otter and a hare. The fox passes away and the novel follows the otter and hare as they deal with the emotions associated with this loss. The book is beautifully written and has lovely illustrations. It really is touching and would certainly help the children realise that there are things they can do to feel better. It's a lovely narrative, and the animals plant and build things in memory of fox. This is a sad story book that is aimed to describe to children feelings and what happens when loved one's die. It is an animated book of an Otter, Mole, fox and Hare who live together and fox is the main hard working member of their family and deals with everything. So when fox gets ill it describes now he becomes weak pale and thin. Fox goes out one day to not return, his friends go in search for him. Thats when they discover he has died and they bury him under foxes faviourite tree. It tells h This is a sad story book that is aimed to describe to children feelings and what happens when loved one's die. It is an animated book of an Otter, Mole, fox and Hare who live together and fox is the main hard working member of their family and deals with everything. So when fox gets ill it describes now he becomes weak pale and thin. Fox goes out one day to not return, his friends go in search for him. Thats when they discover he has died and they bury him under foxes faviourite tree. It tells how the Hare, Otter and Mole cry as they miss fox so much. But also has a nice message and picture of fox that they will never forget fox - always and forever. This book can be used to help children express their feelings at sad grieving times wheather it is a pet or friend or family member. In this story the reader is introduced to four best friends and they all live together and look after one another, but one day their dear friend fox dies and the other animals become extremely sad and do not feel like going out or eating. However, squirrel comes to visit the animals and reminds them of all of the good times that they had with fox and what a good friend he was to them all. They decide to make fox's favourtie tree where he is buried the special place where they would go to remembe In this story the reader is introduced to four best friends and they all live together and look after one another, but one day their dear friend fox dies and the other animals become extremely sad and do not feel like going out or eating. However, squirrel comes to visit the animals and reminds them of all of the good times that they had with fox and what a good friend he was to them all. They decide to make fox's favourtie tree where he is buried the special place where they would go to remember him. I highly recommend this book. It has big, beautiful bright illustrations and a sweet message. Great for anyone who has experienced a loss of a loved one. Wow…what a powerful story. I actually lost my oldest sister a little over five years ago, so reading this with my other sisters brought out some sad feelings. Losing a sibling, a friend, is something that goes so deeply and affects you so much. There are moments that are still hard for me and so reading this book resurfaced the toughest time when Inez was slipping away from us and then finally left. With that being said, I thought this story was presented beautifully and honestly. Yes, the animal Wow…what a powerful story. I actually lost my oldest sister a little over five years ago, so reading this with my other sisters brought out some sad feelings. Losing a sibling, a friend, is something that goes so deeply and affects you so much. There are moments that are still hard for me and so reading this book resurfaced the toughest time when Inez was slipping away from us and then finally left. With that being said, I thought this story was presented beautifully and honestly. Yes, the animal friends were sad, but Squirrel helped them to remember the good times, so there’s a balance of both feelings. I found the transition from one to the other smooth and logical. I loved the illustrations here and especially the split pages. On one side of these pages followed the present storyline where the fur friends were talking, while the other side of the pages were of Fox, when he was alive and acting out each story. This part of the story helped smooth out the feeling transitioning as I mentioned in the previous paragraph. Overall, I loved how real the emotions felt in the story, but without it being overwhelming. The healing process and the sweet ending made this to an even better read that I truly enjoyed. I would highly recommend this children’s read to children who have or even have not experienced the feelings of loss and grief. It would be a great introduction and would open conversation on this otherwise sensitive subject. Make sure that you have a tissue handy before reading this! The story follows a family of animals who live together in the woods, each doing their part to keep their lives ticking along. Until Fox begins to get sick and, one day, he walks off into the woods and doesn't come back. His friends and family find his body and bury him, before entering a period of grieving during which it feels as if they will never be able to laugh or smile again. When their friend, Squirrel, comes to visit, he reminds Make sure that you have a tissue handy before reading this! When their friend, Squirrel, comes to visit, he reminds them of the happy and ridiculous times they shared with Fox and they remember just how much Fox liked to laugh and smile. I will not be adding a synopsis of the book to my review as that has already been done by others here very well. I found this book during a book fair at my two daughters' elementary school. They were about 5 & 7 years old at the time, and they had not yet experienced the death of a loved one/family member. I skimmed it at the fair and was impressed with the author's way of handling the subject matter with such honesty and tenderness, so I decided to put it in our bedtime story rotation (even I will not be adding a synopsis of the book to my review as that has already been done by others here very well. I found this book during a book fair at my two daughters' elementary school. They were about 5 & 7 years old at the time, and they had not yet experienced the death of a loved one/family member. I skimmed it at the fair and was impressed with the author's way of handling the subject matter with such honesty and tenderness, so I decided to put it in our bedtime story rotation (even though it is a very sad story). My reasoning for this decision was that death is part of life for all of us, and I wanted to give my girls a sense of what we feel when someone we love dies so that they might have some basis for understanding their feelings, and so they wouldn't be blindsided by them once they were faced with a real loss for the first time. I have never felt that my role as a mother is to shield my kids from frightening and painful realities they will have to face someday. Rather, my job is to prepare them for these difficulties. Instantly, it became one of their favorite stories and they would ask for it at bedtime often. They would pay very close attention while I read it and asked me many questions, which opened several frank discussions about loss and coping with grief. Overall, I was very pleased with my decision to share this story with them preemptively while I could be objective and not distracted or perhaps consumed by my own grief. I read this book during one of the RE session's at UEL and I felt it was a particularly good book to use in class when dealing with the topic of death. It would be particularly useful if a child has recently experienced a death in their life, a topic which can be very difficult to approach sensitively with the whole class. It could be used as a circle time actiity in order to create a safe and secure enironment in which to discuss the topic. 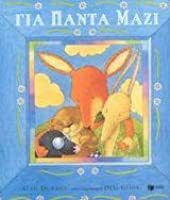 The story is about a group of animal friends; a fox, an I read this book during one of the RE session's at UEL and I felt it was a particularly good book to use in class when dealing with the topic of death. The story is about a group of animal friends; a fox, an otter and a hare. 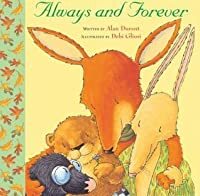 The fox passes away and the book follows the otter and hare as they deal with their emotions as they come to terms with their loss. In the end, they agree that moping around is not what fox would have wanted and they plant and build things in his memory. The book has lovely illustrations and is very beautifully written. It really is touching and would certainly help the children realise that there are things they can do to feel better. This book gives a heart-warming account of how we deal with bereavement and come to terms with the loss of somebody close to us. Told through beautiful illustrations, this story gives an account of a family; the otter, the mole the fox and the hare who all share a home and live together as a family in the woods. When the loss of a family member occurs the rest are left deeply saddened and heartbroken with the loss of the father figure of the house. The beautiful illustrations are poignant and de This book gives a heart-warming account of how we deal with bereavement and come to terms with the loss of somebody close to us. Told through beautiful illustrations, this story gives an account of a family; the otter, the mole the fox and the hare who all share a home and live together as a family in the woods. When the loss of a family member occurs the rest are left deeply saddened and heartbroken with the loss of the father figure of the house. The beautiful illustrations are poignant and demonstrate how in times of bereavement it is possible to overcome sadness through the love and support of others around us. It shows a transition from the initial sadness of dealing with death to the eventual reflection of happy times which were shared with the person who remains in our hearts. This book is suitable for children of all ages who are dealing with the loss of somebody close to them. It gives reassurance that there is always light at the end of the tunnel. This book is about three animal friends that live together Fox, Mole and Rabbit. One day Fox gets sick and goes off into the forest and doesn't return. Mole and Rabbit find Fox's body and bury him. Mole and Rabbit are very sad and do not know how they will cope without Fox and they do not go outside as they are too sad. Then one day Squirrel pays them a visit to find out what has happened. 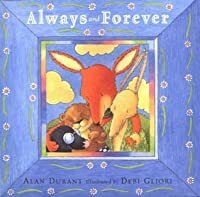 Squirrel reminds them both of all the good times and laughter they had with Fox and that it is important to This book is about three animal friends that live together Fox, Mole and Rabbit. One day Fox gets sick and goes off into the forest and doesn't return. Mole and Rabbit find Fox's body and bury him. Mole and Rabbit are very sad and do not know how they will cope without Fox and they do not go outside as they are too sad. Then one day Squirrel pays them a visit to find out what has happened. Squirrel reminds them both of all the good times and laughter they had with Fox and that it is important to remember these to keep his memory alive. This is a very sweet tale which covers issues of death and grief. The book is well illustrated and would be good to read to children who have questions about death. The story is sensitive and focuses on the positive memory of the person they have lost. This is a very good book to introduce children to coping with loss and also could be a good introduction to the subject of death.There are large pictures which would make it very easy to tell a class and show them the pictures. There are four main characters an otter, a mole, a fox and a hare.They are great friends but unfortunately one day the fox dies. They are all very sad until the squirrel, a friend, comes along and reminds everyone of all the fun times they had with the fox. they all share This is a very good book to introduce children to coping with loss and also could be a good introduction to the subject of death.There are large pictures which would make it very easy to tell a class and show them the pictures. There are four main characters an otter, a mole, a fox and a hare.They are great friends but unfortunately one day the fox dies. They are all very sad until the squirrel, a friend, comes along and reminds everyone of all the fun times they had with the fox. they all share memories and begin the cope with the loss of the fox. This book was incredibly touching and real. After losing my mom recently, I checked out many books on loss to help my daughter who was having a hard time with it. This was by far the best book. I was in tears myself and had a very difficult time reading it. It was a touching story of three friends that were a family and about the loss they suffered and how devastated they were and how they finally came about to dealing with the loss. To just read the story would be fine though it is very, very s This book was incredibly touching and real. After losing my mom recently, I checked out many books on loss to help my daughter who was having a hard time with it. This was by far the best book. I was in tears myself and had a very difficult time reading it. To just read the story would be fine though it is very, very sad. But I highly reccomend it to anyone who has suffered a loss. Even to adults....it spoke more to me in its few simple pages then all the big how to deal with your loss books for grown ups did. A moving book about a fox who dies. His friends were as good as his family and were very sad about him passing on that they couldn't go on and just stayed at home. One day a rabbit comes along and says to the friends that he has not seen them in a long time. They said they couldn't go out and have fun without fox, so the rabbit decides to help them and explains to them that life has to go on. All of the friends started remembering the good times and memories they had with fox. They made a memori A moving book about a fox who dies. His friends were as good as his family and were very sad about him passing on that they couldn't go on and just stayed at home. One day a rabbit comes along and says to the friends that he has not seen them in a long time. They said they couldn't go out and have fun without fox, so the rabbit decides to help them and explains to them that life has to go on. All of the friends started remembering the good times and memories they had with fox. They made a memorial bench and a garden in rememberance of fox and would go there to reminisce. A very warm book which i think is great for R.E for children to have a little understanding about life and death, memories and moving on. The illustrations are also great by Debi Gliori, very colourful and detailed! This book is a fantastic, touching book about dealing with the death of a loved one. It follows a family of animals who lose the head of their family, the fox. It follows them going through morning, and then learning to remember the things about the fox that makes them happy. I think this is a perfect book for introducing young children to the concept of death. It explains the concept very nicely, walks the children through the feeling of mourning and then explains how to remember the happy times This book is a fantastic, touching book about dealing with the death of a loved one. It follows a family of animals who lose the head of their family, the fox. It follows them going through morning, and then learning to remember the things about the fox that makes them happy. I think this is a perfect book for introducing young children to the concept of death. It explains the concept very nicely, walks the children through the feeling of mourning and then explains how to remember the happy times with the deceased. The artwork is also superb and the text is very well written. This was a truly heart wrenching book of grieving the loss of a dear friend. I wasn't expecting a story of this nature when I opened the cover, but lo and behold that's what I got. It was well written, beautifully illustrated and very personal. It brought to mind deaths that I've experienced in my own life. It was difficult to take, but handled the situation with such delicate honesty that it made the experience joyful and celebratory rather than depressing. This was the first book that I had come across that deals with bereavement. This helped me realise that death and losing a loved one might need some explanation within a class setting. This ironically helped through a recent stage when I and others were bereaved. It's all a part of life. A part that is often left unspoken but I would recommend the read. When 3 friends lose their very special friend, Fox, they are so sad for a long, long time. Squirrel comes over to console them and cooks a lovely dinner. While she cooks they all reminisce about Fox. Memories of Fox help them to feel better. This colorfully illustrated book would be a nice selection for children ages 4 and up who are mourning the death of a friend. A nice tale of how forest friends lose fox. Fox had been an instrumental part of their circle of friends, so his passing had a big impact. Nice illustrations by Debi Glior created a nice environment for the characters. i may have shed a tear while reading this one. soooooooooo beautiful. Alan Durant is the author of books for a wide age-range, from picture books such as Burger Boy to top-end teenage thrillers (Blood, Flesh and Bones). Having worked as a copywriter at Walker Books, he is now a full-time author. He's married, with three children and lives just outside London. He does a lot of school visits throughout the UK and abroad and also runs writing workshops.